Jaipur: Pakistan's human rights crusader Ansar Burney has asked both India and Pakistan to stop exchanging bodies, and consider sending people alive back home. “The real goodwill would be in exchanging people live and not their dead bodies,” Mr. Burney, who visited the mausoleum of Sufi Saint Khwaja Moinuddin Chisti in Ajmer on Thursday, said. The activist-lawyer, instrumental in creating a lot of goodwill between India and Pakistan in the past few years, could not meet Pakistani virologist Khaleel Chishty who is in Ajmer jail after a court sentenced him for life this January, though the main purpose of his visit this time appeared to be that. “It is time that Pakistan and India do away with the borders dividing both the nations,” Mr. Burney told journalists at Ajmer Dargah. “They should learn from the experience of the European Union countries and allow visa-free entry for their citizens,” Mr. Burney said. The nations in EU too were fighting detrimental battles in the past but now they co-exist in peace, he noted. “Why don't we have a South Asia Union through which all the nations could exist in peace and prosper,” he asked. “Let us get rid of the border and grow roses there as mark of love and affection for each,” he suggested. Mr. Burney's grand parents were from India (Bulandshahar, Uttar Pradesh). “For me, both the countries are important and I want peace between the two,” he said. Ajmer-based Salman Chishty, who accompanied Mr. Burney in the Dargah, said the latter prayed for “peace and harmony” between the two countries. “People are suffering on both the sides of the border; be it terrorism, human rights violation or other types of deprivation and misery. The present situation has to change,” Mr. Salman Chishty said quoting the Pakistani lawyer. Mr. Burney, who echoed the sentiments of human rights activists in India over the release of 78-year-old Dr. Chishty — now a wreck with many ailments —appealed to the authorities here to facilitate his early release. “If Dr. Chishty is sent back to Karachi to his ailing wife who has turned deaf as well, it would generate more goodwill between the two nations than any other major political or diplomatic move,” he suggested. “In Pakistan, the impression is that Indian media has been very supportive to the cause of Dr. Chishty,” he said. Mr. Burney felt that Dr. Chishty was being singled out for the kind of treatment being meted out to him when others involved in the case, including the co-convicts in the murder which had taken place some 19 years back, were out on bail. He said the cases of Sarabjeet Singh and Dr. Chishty were different as the latter did not have any terrorism charges against him. “Both cases cannot be compared. However, on my part, I am against death penalty,” Mr. Burney said. Asked about the repatriation of Dawood Ibrahim, he said that if there were charges of terror acts against him he should be handed over to India. However, Mr. Burney added that he did not want to politicise issues. “I am a human rights activist. I don't want to do politics,” he asserted. Mr. Burney, who later boarded a plane to Mumbai from Jaipur, told Kavita Srivastava, general secretary of the People's Union for Civil Liberties (PUCL) Rajasthan that he intended to seek an appointment with Rajasthan Governor Shivraj Patil. “He has taken visas for Delhi, Jaipur, Ajmer, Mumbai and Chandigarh and plans to meet the Governor in Chandigarh,” Ms. Srivastava said. However, while in Jaipur, his thrust was on Rajasthan Chief Minister Ashok Gehlot pushing the case to its logical conclusion as the latter had cleared Dr. Chishty's clemency petition back in June,” she informed. 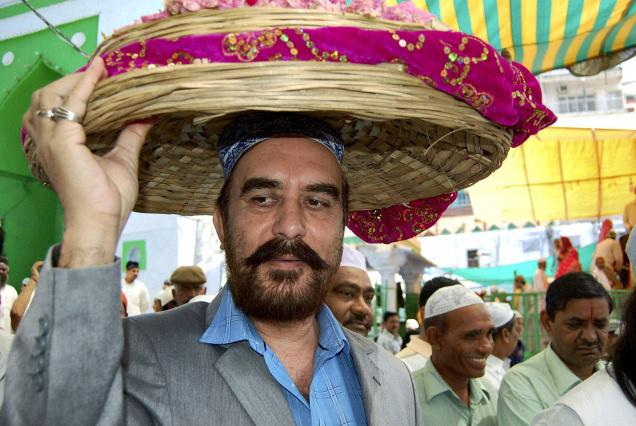 Picture: Pakistani human rights activist Ansar Burney paying a visit to the shrine of Khwaja Moinuddin Chishti in Ajmer on Thursday. Photo: PTI.